In French cuisine, sauces take center stage, and every culinary student learns about the five mother sauces. Each start with a different liquid and are then thickened, most of them by a roux. They are referred to as "mother sauces" because there are several other sauces that are based on these five: Bechamel, Veloute, Espagnole, Hollandaise, and Classic Tomate. One of these sauces is the White Wine Sauce, based off of the Veloute Sauce. It is a finished sauce made by reducing white wine and then simmering it in a basic fish velouté and some heavy cream. 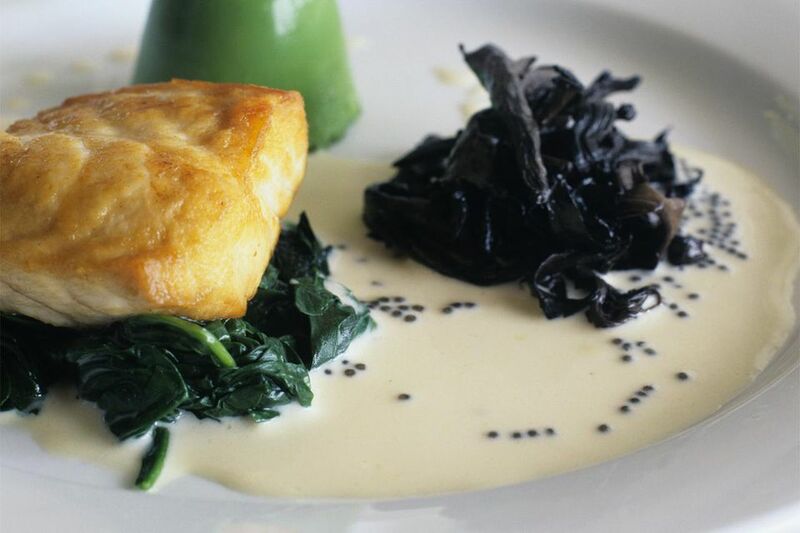 The White Wine Sauce is an ideal accompaniment for all kinds of fish and seafood dishes. It is also the foundation from which a number of other classical sauces are built, such as the Herb Sauce, the Shrimp Sauce, or the Venetian Sauce. In a heavy-bottomed saucepan, gently heat the heavy cream to just below a simmer, but don't let it boil. Cover and keep warm. In a separate saucepan, simmer the wine until it has reduced by half. Add the fish velouté to the wine, bring to a boil, then lower heat to a simmer and reduce for about 5 minutes, or until the total volume has reduced by about 1 cup. Stir the warm cream into the wine mixture and bring it back to a simmer for just a moment. Stir in the butter, season to taste with Kosher salt and white pepper, and add just a dash of lemon juice. Strain through cheesecloth and serve right away. Veloute is one of the five mother sauces and is made with any white stock such as fish, veal, or chicken. It is made by combining a roux—melted butter and flour cooked to a pale yellow paste—with fish stock and simmered until it is reduced and has a velvety consistency. The fish stock is what makes the White Wine Sauce ideal to serve with seafood. When cooking with wine, particularly when making a sauce, you want to keep in mind that when the alcohol is cooked off you are left with the sweetness and the acidity. So you want to choose a nice, dry white wine for making this sauce. Of course, a French varietal would be quite appropriate, but if you are choosing from what you have in your wine collection, selecting a Pinot Grigio or Sauvignon Blanc is best. A Chardonnay will also work as long as it is not too buttery and oaky.